There’s one steadfast rule about using tile in your home that you should never forget: Never use wall tile for floors. Got it memorized and written in stone? Now that we have that out of the way, here’s a twist - you CAN use floor tiles on walls! Since wall tile does not need to hold up to foot traffic, unusual and exotic tile materials can be used for bold, unique, eye-catching installations that allow decorators and homeowners to completely break up any monotony within rooms. Glass, leather, tin, steel and of course stone can be used on walls to dazzling effect. Consult with a professional regarding the weight of the tile itself before selecting floor tile to be used on the wall though. The BAL weight restrictions chart will help you determine if the combined weight of your tile, adhesive and grout exceeds the maximum weight measurement of the surface on which you are tiling. This will become especially important if you want to use the same tile on your floor and walls for a distinctive look. Flowing visual continuity can produce amazing designs, and using floor tiles on your walls will help you achieve the following awesome results. Thin, linear tile in white can make a bathroom both sophisticated and serene if used on both the floor and walls. Calming, yet modern and stylish, the combination creates subtle visual impact while maintaining a relaxed feel. Perfect for clean, rich texture that doesn’t overpower. Using floor tile on kitchen walls will enhance the clean lines and sleek, smooth surfaces that characterize the modern kitchen. Crisp whites or dark grays capture an ultra-chic feel and form a backdrop for bright colors, accessories, light shades and bar stools to pop against. Equal parts functional and stylish, tile provides the perfect easy-to-clean kitchen surface as well. Versatile gray tiles are available in a variety of shades, textures and finishes, from gentle beige to darker tones, and fit nearly every design scheme. The combined effect of gray shades for both wall and floor tile creates effortless sophistication. Get creative and layer the gray tones by using one for the floor and one or two different varieties on the walls. In small rooms, tile can work wonders in transforming the overall feel. Mosaics and tile that require many grout lines will probably look and feel too busy in a small space. Medium-sized tiles in longer or hexagonal shapes are perfect for creating eye-catching design that flows visually from floor to wall. Tiles with surfaces that bounce or reflect light will also help make a space feel more airy and bright, creating the illusion that the room is bigger than it actually is. Tile equals timeless style for good reason; you can truly craft the one-of-a-kind look you envision while generally not maxing out your budget. 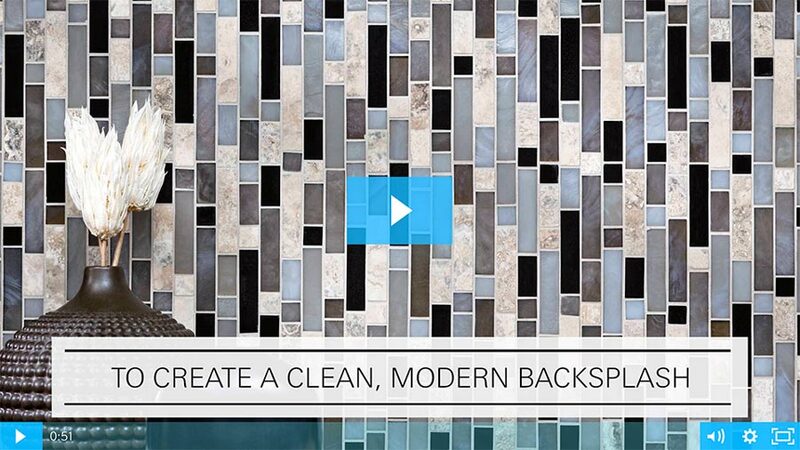 Get inspired, and see if one of stylish tile options can give your home that stylish edge you’re looking for.